Have you ever wanted to pretend that you were one of the American Girl characters? Now you can in the American Girl Treasures game. Learn about the characters by acting out their stories and exploring the time in history in which they lived. You'll even get to collect fun tokens from their lives. Players get to go to different locations to try to trade for the four tokens that they'll need to win. American Girl Treasures teaches about different times in history and lets little girls get to know some of their favorite characters. 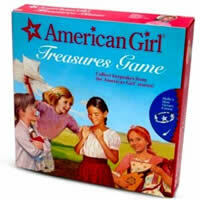 Be sure to check out the game American Girl Treasures. Each American Girl has keepsakes that she treasures! Play as your favorite American Girl character and collect her favorite keepsakes. The first player to collect 4 keepsakes and get back to the home space wins the American Girl Treasures game! The American Girl Treasures game comes with game board, 8 American Girl Movers, 64 Keepsake Tokens, 110 Cards (75 Travel & Trade Cards, 35 Action Cards), 4 Trunks, and the American Girl Treasures rules and instructions booklet. Please keep in mind that the official American Girl Treasures board game rules and instructions could be different depending on the game version you have. The rules below are some of the exact directions on how to play American Girl Treasures. Share with us your comments, funny stories, tips, advice, strategies, creative ways to play, questions about how to play, problems with the rules or anything you want about American Girl Treasures. All submissions will be reviewed within 24 hours. Click here to add your American Girl Treasures comments. This is like my favoritest game eva.